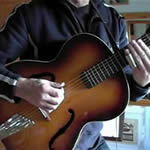 Learn slide guitar with this Guitar Tuition DVD. This DVD will explain the basics of slide guitar and how to incorporate slide guitar into your playing. The lessons will take you through various methods of slide guitar, tunings and exercises to help you develop your skills in this style of guitar playing.